Whoa Training - Griffology...where every paw counts! The complete bird dog's goal in life is to go into the field, search, and find gamebirds. When he makes bird contact, he should immediately go on point and hold his point until the hunter arrives to flush and shoot the bird - nothing you haven't heard before. Your dog will hold birds and be steady to wing, flush, shot, and fall. Your dog will be under control and will stop on command. This is important when your dog is heading for danger, such as crossing a busy road or a railroad. Your dog will honor another dog's point. Your dog will hold still while you load the truck or when the vet is treating him for minor medical purposes. If your dog will lie still on a "whoa" command while he is getting X-rayed or stitched up, you possibly will not have to have him anesthetized. The time to start whoa training is after your dog has had a season in which he can learn as a young pup to boldly go out and find birds. This first season is his fun and learning time, but now that he has built up a love for birds and a strong hunting desire, you can start putting on the controls you will need to make your dog a part of a successful' hunting team. There are many different ways to whoa-train your dog. Delmar Smith used the whoa post, George Hickox uses his platform, and many people use a training table. All of these methods work; however, the training technique that I like the best is the one developed and taught to me by Jeff Funke. The first phase of training can be done in your own yard. You will need a pinch collar and a 10-foot lead rope. A pinch (photo to the left) collar is a long collar that has flattened spikes sticking out of the inside. The tag end of the collar slips through a roller bar that allows the collar to be tightened and loosened with ease. You will see some collars with pointed spikes. These are not pinch collars, they are force collars. If you buy a collar with sharp points, you must flatten them - get a file and a hammer; lay the file on top of the points and hit it with the hammer to flatten the points. You do not want the collar to cut or hurt your dog. The sessions should be kept short: five to 10 minutes, twice a day. In our training, we are going to use the same type of controls that the mother dog used to control him when he was a young puppy. If you have had an opportunity to watch a mother dog with her young pups, you will see her use her mouth to quickly and firmly grasp her pup around the neck. By doing that, she has total control over the pup. The pup's reaction is to freeze. He's afraid to move until momma releases her hold. 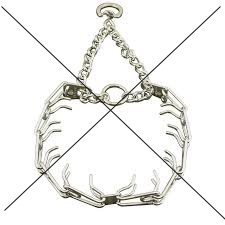 We are going to use the pinch collar and the lead to duplicate this same situation. For example, before you feed your pup, grasp the top of his collar and pull up with a gentle, yet firm jerk. Make your pup stand until he relaxes and no longer fights against your restraint before you allow him to eat. You can use this same technique before allowing your pup to do any number of activities such as retrieving, having a treat, or being released from a kennel or a vehicle. To get started, put the pinch collar on your dog and snap the lead to the free end of the collar. 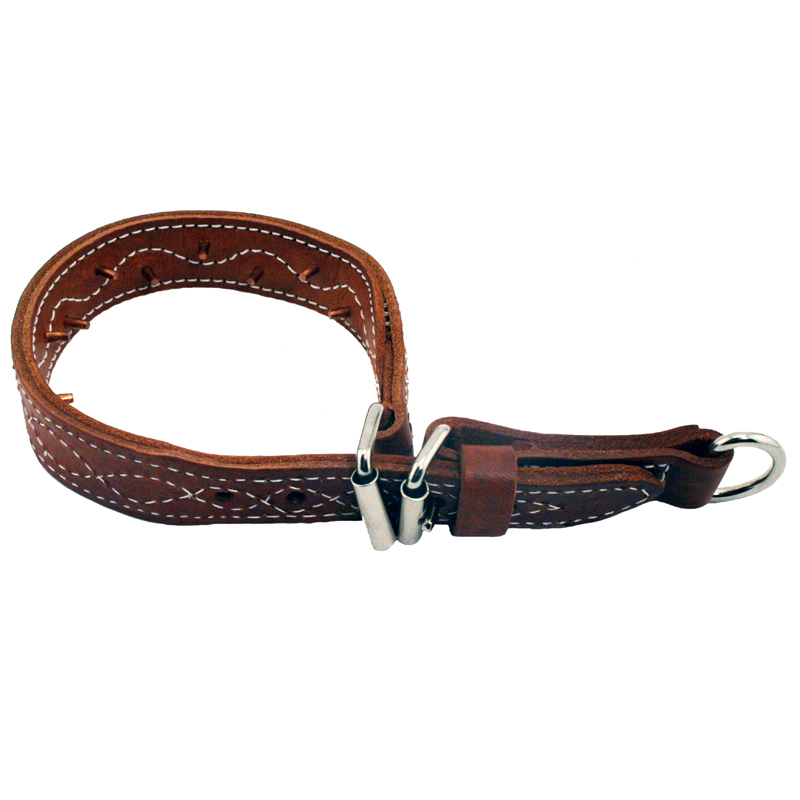 The collar should look like the letter “P” when it is on your dog, the free end should be pointing toward the ground. While your dog is standing still with the collar on, pull up on the collar and pinch him. Release it immediately and praise your dog. If he sits down when he's pinched, put your foot under his belly and gently lift him up to a standing position. After he stands when you pull up on the collar, start walking your dog with a loose lead and the pinch collar loose around his neck. When your dog's mind is not on you or the collar, quickly pull up on the lead, closing the collar firmly around his neck. Your dog should stop immediately. If he does, quickly release the collar and praise your dog with a verbal, "Good boy," and a pat on his shoulder. You want your dog to know that when he stops to the pressure of the collar on his neck, he is doing the right thing. This part of the training is a conditioned response - the dog will learn to stop whenever he feels the collar tighten around his neck. At this stage, your dog will learn faster without any verbal commands. We'll introduce both a verbal and an electronic command at a later stage in the training.